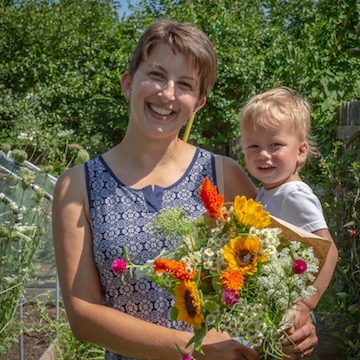 AM Flower Farm is a West Lafayette urban farm that grows beautiful, fresh, garden-style blooms. Our flowers are available through our flower subscription service, via online ordering for delivery or pickup, and pop-up shops and festivals throughout the summer. Delivering to West Lafayette and the Purdue Campus. A flower subscription is a weekly delivery of premium, farm-fresh flowers grown sustainably in West Lafayette, Indiana. We appreciate our customers, and we hope you love your flowers, whether they're a gift or for yourself to enjoy. "I wish to thank you again for making the beautiful bouquet for my professor. I received a very happy email from her two minutes after she got home, saying that she was speechless and their beauty. I’m so glad you did this for us." 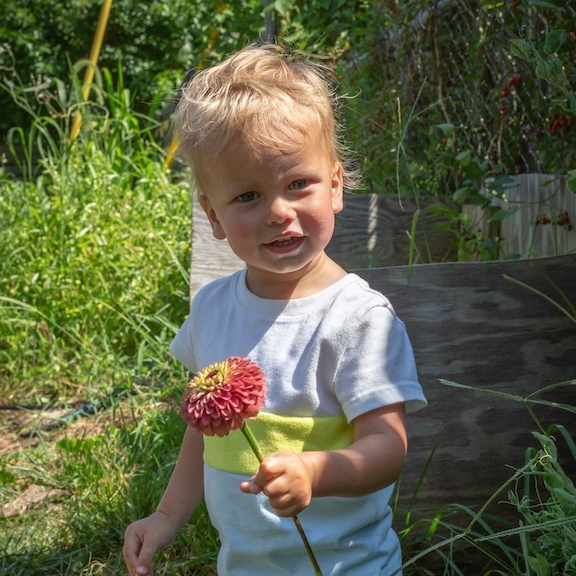 Yes, you’re supporting this handsome goofball when you buy beautiful Indiana flowers from AM Flower Farm, and no, I couldn’t possibly choose just one photo. For floral eye candy, where I’m selling each week, and which flowers are blooming. Special thanks to Tina Thelen for her photography, seen in several images throughout this site.